Any discussion of the census data immediately brings to mind the issue of population growth rate and consequentially, the population density. We put up for views and comment certain nuances of the two indicators. We show that there are clear regional patterns and contiguous belts with different bands or range of the two indicators. We also see that, contrary to the popular belief that population growth is the cause of poverty, we see a four-fold grouping: Low population density low development, Low population density and high development, high population density high development and high population density with low development. Viewers are welcome to fine tune the analysis further. India’s population density has grown from 325 persons per sq km in 2001 to 382 persons per sq km in 2011 an increase of 17.5%. This is understandable given the growing population on the same land mass. But averages could be deceptive! Different regions of India have grown at different pace; growth has been on account of natural population growth as well as migration. Table gives the population density figures at the state level for the 2001 and 2011 census. 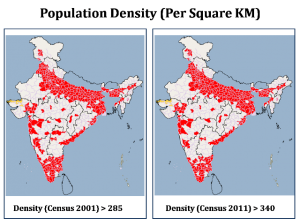 The Indian landscape can roughly be divided into three categories based on whether the population density is low, medium or high. In 2001 the cut off levels of less than 170 persons per sq km, 170 – 285 persons per sq km and above 285 persons per sq km give three contiguous belts where the population density can be considered to be high. In 2011 the density is expected to grow. What is remarkable, however, is that the same spatial classification persists if the levels are adjusted to 195 in place of 170 and 340 in the place of 285. This is consistent with the overall growth % of 17.5% at all India level. However, it the district level the picture may change. 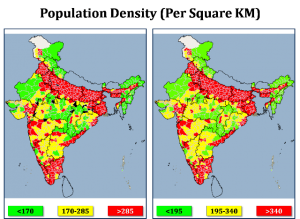 It is instructive to see has the low, medium and high density regions have experienced the change in population density. This reinforces the pattern that low population density districts are growing slower that the medium and high population density districts. An interesting point arises here. Contrary to the general perception that lays all the blame of underdevelopment at the door-steps of population growth, we get a more nuanced pattern. We have low density regions with high as well as low levels of development and equally importantly there are high density districts which are developed as well as underdeveloped.